Polaroid High Definition 100 24 Exp. 35mm. Expired. Dispatched with Royal Mail 2nd Class. 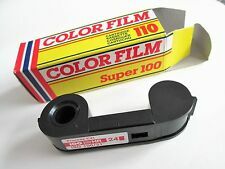 Kodacolor in filmmaking was an early movie system that used filters to record additive color on monochromatic lenticular film. ILFORD DELTA 100. 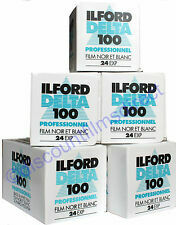 Delta 100 is a finer grain film then Ilford FP4. 35mm 24 exposure. Ideal for landscape and architectural photography. A fine grain film with excellent tone range. 4 x Kodak Gold 35mm Colour Film C41 Negative. Outdated 2001. Film Format - 35mm (24 Exposures). EXPIRED 1992. LOMOGRAPHY FILM. 50p FOR MOST EXTRA FILMS FOR THE REST OF WORLD. 100 ASA 135 24exp. 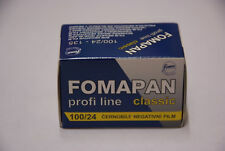 FOMAPAN 100 Classic panchromatically sensitized, black and white negative film of the speed ISO 100/21. Delta 100 35mm 24 exp. Superb image quality, precise rendition. TRUPRINT 110 FILM EXPIRED 1987, 110 FILM 24 exp Vintage I can't guarantee that these films will work due to expiring a long time ago, but the box and film have been stored correctly and is sealed. Box might have a little wear and tear as was stored in a old shop that went out of business a long time ago. Any questions please let me know. Many more films for sale. 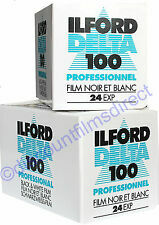 Ilford Delta 100 is a high speed, medium contrast film making it especially suitable for action and press photography and also an excellent choice for general purpose photography. Nominally rated at ISO 100, it yields negatives of outstanding sharpness and fine grain under all lighting conditions. Ilford Delta has been formulated to respond well to push processing and film speeds up to EI 100/36 are achievable with ILFORD MICROPHEN developer maintaining good shadow detail and well separated mid-tones with sharp grain. Polaroid High Definition 100 24 Exp Expired film. expired in 1991. Made in Japan. Expired 1990/1996 but always kept cold so might be in good condition. Film type The film is. However as should any expred film be trearted,it should be overexposed by 1 stop at least and used for tests or trilas only. 10 X 24 exp rolls. FujiFilm Super HR 36ex. Expired in 1999. Fuji Fujicolor 100 24 exp 35mm. Expired in 2000. Process C41 ISO 100. Kodakcolor 100 24 exp 35mm. expired 2002. 24 exposures. Agfa XRS 100 35mm 24 exp. KONICA SR 100. EXPIRED 1986. LOMOGRAPHY FILM. Fuda GA 100 Expired Film 35mm expired film. expired 98.